2007 was an interesting year with a few highs and lows but overall another very rewarding time. The Spring was an especially successful time with many personal records. The 2nd half of the year saw a few disappointments but even then there were several highlights. I had focused so much energy on training for Western States and after my DNF there, I seemed to be tired for a much longer than normal amount of time. The recording setting heat of the summer and early Fall probably contributed a lot to that too. So here is how it went. The year started off slowly as I was recovering from the knee injury that caused me to miss running the last 2.5 weeks of December. I was very happy that after a few test runs I was able to run the Salem Lakeshore Frosty 50K on the 6th with my friend and frequent training partner, the beautiful young Jenn Ennis. I had wanted to run it last year which was her ultra debut but training for my Boston Qualifier didn't allow it. We had a great time and she improved her time despite running with considerable shin pain the last half. On the 20th I traveled to Virginia and the Swinging Bridge Trail run held on the beautiful Willis River Trail. Had a lot of fun running most of the 35 K with my trail buddy Graham. My first main goal for the year was to attempt a 100 mile Pr at Rocky Raccoon in Huntsville State Park, Texas. I wasn't quite as fast a I hoped but accomplished the goal with a 23:15 and I got to run a little with the Trail Princess. 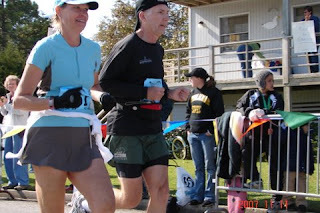 Two weeks later and with a quick recovery, I ran the Myrtle Beach Marathon with Karla, The Marathon Princess. As always it was joy to run beside her. It was a tough, slow run for her as she was just beginning to recover after completing her cancer treatments just two months earlier. A week later I found myself at the Mt. Mitchell Challenge 40 miler. I was feeling good but after a 100 just three weeks before and the marathon last week I expected to be tired. Ended up having a great run and achieved my goal of breaking 8 hours. Most enjoyable was the perfect weather conditions and running with Tony Rouse for about 35 of the miles. On the 10th I ran the Umstead Trail Marathon again. Although not nearly as bad as last year, I still had a long slow run. At least I had good company with Tony again and many of my friends were running and volunteering in my home training area. I was happy to see the return of the Gator Trail 50K on the 24th. I had not had the chance to run it in the past and was planning to go for a 50K pr. The weather was unseasonably hot and I had a disappointing meltdown and a warning of the hot weather yet to come. In April I returned to the Bull Run Run 50 miler. With perfect weather and trail conditions, and some great company from Fred Dummar in the first half of the race, I improved my time by over 1:40:00 from two years ago. Two weeks later I returned to one of my favorite races, the Promise Land 50K and again Blessed with great conditions, I ran a course PR by 40 minutes and probably felt better from start to finish of any ultra I've ever run. I returned to Capon Valley 50K with hopes of a new course PR and with the way I had been running I felt that would be easily done. Warm weather and some lingering fatigue from a hard year of racing and training however caused it to be a slow day. At least I got to run in a gorgeous setting with many friends and especially nice to run the early miles with the Trail Angel Laura. A week later a group of us ran the 26.7 mile length of the Falls Lake Trail for fun with the great roving aid support of Mike Waldvogel and Rhonda Hampton. Started the month running the 5k Race for the Cure with Karla and Jerry. Her first time in this race as a survivor. A wonderful day and she showed much improvement as she continued to grow stronger. Then it was off to Western States. A fantastic vacation but a heartbreaking DNF. Lessons learned and someday I hope to return and claim my finishers buckle. Was hot but a welcome cool front moved into the southeast just in time for Catherine's FA 50K at Massanutten Va. I think the weather was the major factor in my shattering my course PR there. As always a great day and post race picnic with my VHTRC friends. I decided not to try any racing in August. It was a miserably hot month and I wanted to concentrate on training for better things in the Fall. The hot weather continued and I had a miserable half-marathon in Danville Va. It was easy to ignore the pain and suffering though sharing the ride and day with the Trail Angel. I had high hopes of improving my distance run at the Hisnon Lake 24 hour run this year but it was not to be my weekend and I was coming down with a bug that bothered me for most of the week afterwards. October saw more training and my first 10 mile race in a very long time at the American Tobacco Trail. The NCRC and R.D. Aaron Quick did a great job with this first time event. I ran well but a bit slower than hoped for. The Marathon Double month. I was afraid that my time at the ATT 10 miler in Oct. was an indicator that I was not ready to qualify for Boston and I was right. Looking back I should have not run Hinson Lake. Just not enough recovery time to run a quality marathon. I still ended up with my 3rd fasted marathon ever. Sunday was even better as I got to run OBX with Karla and had Jerry along for over half the race. It was a great day and I was so happy and surprised that Karla had improved so much in the past year. Another few months of training and she will be back as strong as ever. Finished up the month with another 50K pr at Mark Long's wonderful little road ultra, the Derby 50K and sharing the trip with the Lovely Jenn. After a hard year of training and racing, I have cut back on my training a little and stayed away from racing to let myself recover. I look forward to another great year which I will kick off in another week at the Frosty 50K. Hope all of you had a good year too. I look forward to seeing as many of you as possible in the new year ahead and possibly meet some more of you that stumble upon my blog.